This booklet is based on a presentation made by two members of Common Cause Ottawa at the “Capitalism and Confrontation: Grassroots Responses to Empire, Ecology and Political Economy” conference in March 2010 held at Carleton University. We thank the conference organisers, the Critical Social Research Collaborative (CSRC), for allowing us to participate. Capitalism has proven itself to be completely inadequate to meet basic human needs. At the dawn of the twenty first century, the world is deeply divided into haves and have-nots. Extreme inequalities have been intensifying since the 1970s. While a minority of the world’s population lives in opulence, the masses struggle in poverty (Schmidt and van der Walt, 2009, pp. 10-11). The latest crisis that has plagued the global economy for the past few years has exacerbated these inequalities even further. The point here is not to advocate some type of ideological purity. Reforms can make huge differences in the day-to-day life of the people. Reformism is a type of harm reduction, and while harm reduction undeniably saves lives, the root problems need to be addressed in a manner that goes beyond mere reforms. However, while a revolutionary solution is necessary, it is far from inevitable. The current economic crisis is the worst the world has seen since the Great Depression. It is important to bear in mind that in much of the world the Great Depression did not lead to socialism or even social democracy, but rather to fascism in much of Western Europe and the consolidation of Stalinism in the Soviet Union (Northeastern Federation of Anarchist-Communists, 2010). Although there is popular dissatisfaction with the current system, libertarian socialist alternatives do not currently have popular support. The current crisis may open up opportunities to attack capitalism from the left, but it also presents dangers for the rise of the most reactionary elements in capitalist society. If anti-capitalists fail to provide a viable and coherent solution to this current crisis of capitalism, the door will be left wide open for reactionary opportunists to exploit public anger. The growth and influence of the Tea Party movement * in the United States is evidence of how anti-capitalists have failed to present convincing solutions to the masses. While careful critique and analysis of the current system remain essential, the more difficult task that anti-capitalists are faced with is developing an alternative to capitalism. As was pointed out during a recent talk hosted by the Workers Solidarity Movement in Ireland, “It’s not enough to fight capitalism, you need to know what to replace it with, and you have to make that alternative the most popular one around and that would be the most important task for revolutionaries today” (Workers Solidarity Movement, 2010). With that in mind, this paper intends to sketch out the basis for a viable alternative to the current state/capitalist system. In setting out to find alternatives, it is essential to have a clear idea of the principles that any possible alternative would be based on. The three main principles that anarchists wish to base any society on are liberty, equality, and solidarity (Kropotkin, 2007, p.156). These three principles set the basic groundwork for the basis of any alternative system. There is a lot of room to manoeuvre within the parameters of these principles, but it is essential that they serve as a guide for any society. It is also important to recognize that these three principles must be taken together as a package; they cannot stand on their own. Each one of these principles is at best hollow and meaningless unless it is accompanied by the other two. “…a definite intellectual current of social thought, whose adherents advocate the abolition of economic monopolies and of all political and social coercive institutions within society. In place of the capitalist economic order, Anarchists would have a free association of all productive forces based upon co-operative labour, which would have for its sole purpose the satisfying of the necessary requirements of every member of society. In place of the present national states with their lifeless machinery of political and bureaucratic institutions, Anarchists desire a federation of free communities which shall be bound to one another by their common economic and social interests and arrange their affairs by mutual agreement and free contract” (p. 1). The key insight provided by this definition is the recognition that freedom must exist on the economic, political and social level. Just as the principles of liberty, equality, and, solidarity cannot be separated from each other; the application of said principles must take place on each of the political, economic, and social levels. The struggle against capitalism is indispensable but it is not the only struggle that needs to take place. Anarchists insist that emancipatory struggle is class-based but recognize that there is no place for reductionism. Anarchism must be based on class, but it must also be feminist, indigenist, anti-racist, anti-ableist, anti-heteronormative, etc. In order to be consistent with anarchist principles, all forms of hierarchy must be opposed. A victory against one form of oppression is at best an incomplete victory. Hierarchies and oppressions cannot be dealt with implicitly or at a later date, they must be confronted head-on the minute that they are recognized, and this organising must be done prefiguratively, the means of ending all oppressions must themselves be based on the principles of freedom, equality, and solidarity. The concept of intersectionality is useful here. It is counter-productive to rank the importance of various social struggles. There are no “primary” and “secondary” struggles (Shannon and Rogue, 2010). Social struggles cannot easily be separated, nor should they be, they must be fought as a single struggle for complete liberation. Anarchism provides a theoretical framework to seek out and oppose all forms of hierarchy and oppression. For example, during the Mexican Revolution the liberal revolutionaries such as Madero had a racist and paternalistic view towards the indigenous population. They viewed native peoples as an inferior and backwards race that ought to have no say in the operations of a “democratic” government. This racist view of the indigenous population was indistinguishable from the views held by those in the Porifirato dictatorship. On the other hand, anarchists, led by Ricardo Flores Magon, fought hard for the rights of indigenous peoples and viewed indigenous civilizations as viable alternative models to the state capitalist system (Maldonado Alvarado, 2004, pp. 59-66). This difference of attitude does not result from the fact that Flores Magon and the other anarchists were personally more enlightened than their less radical counterparts, but rather a direct result of ideology. If an ideology allows for one form of hierarchy (in society, in politics, or in economics), it is much easier to accept a series of other oppressions. Anarchism however does not allow for any form of hierarchy to exist. This does not mean that anarchists are always successful at identifying and addressing all types of hierarchies (Wright, 1994). There is also the possibility of the existence of oppressions hitherto unidentified (Chomsky, 2005 pp. 221-222). However, it does mean that while any form of racism, sexism, ableism, etc. could possibly be assimilated into a capitalist or statist worldview, they could never be assimilated into an anarchist worldview, provided that one consistently upholds anarchist principles. Characterizing this debate as a generational one grossly misrepresents the reality. Following Grubacic’s formula, there are a significant number of activists involved in anarchist organisation whose political formation must have taken place decades before they were even born. Also incorrect is the implication that organisationalists are class reductionists that ignore indigenous, feminist, ecological, and cultural struggle. The debate between organisationalists and anti-organisationalists is not at all new. It has been ongoing in the anarchist community for at least a century. On the heels of the failure of anarchists to prevent the consolidation of the Bolshevik dictatorship following the Russian Revolution, a group of exiled Russian and Ukrainian anarchists called the Delo Truda (Workers’ Cause) Group wrote of “this disease of disorganisation (that has) introduced itself into the organism of the anarchist movement and has shaken it for dozens of years” (Delo Truda, 1926). It is very tempting for anarchists to reject most forms of organisation. After all, the types of organisations that most people are used to dealing with are hardly non-hierarchical groups that adhere to anarchist principles. Mainstream political parties, unions, and NGOs tend to have power placed at the top. It is understandable that anarchists would be sceptical of organisation. However, the problem with most organisations is how, not that they are organised. The enemy is not organisation, but hierarchy and as Malatesta (1897) points out, “organisation, far from creating authority, is the only cure for it and the only means whereby each one of us will get used to taking an active and conscious part in the collective work and cease being passive instruments in the hands of leaders”. As long as organisations are based on anarchist principles, they are not only effective, but essential tools in combating hierarchy and oppression. Lack of formal organisation actually tends to create structures that are contrary to anarchist principles. Just because these structures are informal, it does not mean that they do not exist. Jo Freeman (1970), writing about the difficulties facing the way the feminist movement was organised, demonstrates this point in her essay, “The Tyranny of Structurelessness”. Those activists who are best connected and most privileged tend to become part of an informal elite who wield significant power over others, often without even being conscious of it. “As long as the women’s liberation movement stays dedicated to a form of organisation which stresses small, inactive discussion groups among friends, the worst problems of unstructuredness will not be felt. But this style of organisation has its limits; it is politically inefficacious, exclusive and discriminatory against those women who are not or cannot be tied into the friendship networks. Those who do not fit into what already exists because of class, race, occupation, parental or marital status, or personality will inevitably be discouraged from trying to participate. Those who do not fit in will develop vested interests in maintaining things as they are”. She also points out the political ineffectiveness of small, unstructured groups who are often only able to accomplish small-scale tasks. “Purely educational work is no longer such an overwhelming need. The movement must go on to other tasks. It now needs to establish its priorities, articulate its goals and pursue its objectives in a co-ordinated way. To do this it must be organised locally, regionally and nationally”. If these organisations do not exist, people will tend to turn to other organisations because “at least they are doing something”. This was evident during the Russian Revolution when large numbers of anarchists joined the Bolsheviks, not for ideological reasons, but because the Bolsheviks were actually organised and accomplishing something. This process is unfortunately visible today, as masses of people angry with the system are turning towards right wing movements in order to express that anger. Anarchists need to create coherent organisations that can attract mass popular support. In order for an organisation to be coherent and to maintain anarchist principles, the Delo Truda (1926) suggested that it contain four basic elements. These are theoretical unity, tactical unity, collective responsibility, and federalism. There is no magic formula for how an organisation must operate, but these four elements are some basic general guidelines for the operation of any effective anarchist organisation. Theoretical unity means that there should be general agreement on what the goals and principles of the organisation are in order to avoid paralysing infighting as much as possible. This means that the anarchist principles of liberty, equality, and solidarity need to be agreed upon by all members. Related to theoretical unity is tactical unity. There should be general agreement over what methods the organisation will adopt in order to reach its goals. The organisation should not be working in several different and contradictory directions, but rather in a common direction. There is a lot of room for disagreement on details, but the guiding principles and tactics must be agreed upon. An organisation is generally formed around common principles and it only makes sense to exclude individuals and ideas that do not work towards those goals. There is no contradiction between this and liberty. Individuals are obviously free to form their own groups or work in no groups at all if they so desire, while working with the organisation in areas where interests and principles do converge. While centralism places the power of the organisation in the hands of a few in a top down structure, federalism is organised from the bottom up. This allows for all individuals to share the same amount of power. There can be a lot of flexibility in the specific details of how an organisation operates, but only federalism provides the structure for real meaningful democratic decision-making. Any member in a position of added responsibility, such as a delegate, must be answerable to the group as a whole and never the other way around. These positions should also be temporary and recallable in order to prevent the formation of any centralized authoritarian structure. Capitalism must be opposed wholesale. Reforms may be helpful in softening up some of its harsher aspects, but the exploitative nature of the system cannot be done away with through reform. Not all forms of oppression can be placed at the feet of capitalism. A project for true liberation must include the struggle to end all oppressions and hierarchy; a revolution against capitalism is a necessary but not sufficient condition for liberation. Anarchists recognize the need to identify and oppose oppression wherever it may exist. Identifying as an anarchist is not important, but identifying, agreeing with and acting upon anarchist principles is essential. Any free society must be based on the principles of liberty, equality, and solidarity. In order to arrive at such a society, anarchists and those struggling for anarchist principles need to be organised. The structures of the organisation need to reflect anarchist principles; they also need to be formal and clear, or else the door will be open for the creation of informal elites. 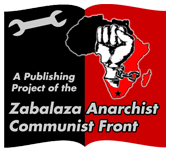 Currently there are a number of such organisations around the world, including Common Cause in Ontario, Canada, that are picking up in the traditions of mass organised anarchism of past periods of revolutionary struggle. These organisations provide the seeds of hope for the development of a society based on liberty, equality, and solidarity. Berkman, Alexander (2003). What is Anarchism? Oakland, CA: AK Press. Chomsky, Noam (2005). Chomsky on Anarchism. Oakland: AK Press. Freeman, Jo (1970). The Tyranny of Structurelessness. Retrieved from http://struggle.ws/pdfs/tyranny.pdf. Maldonado Alvarado, Benjamín (2004). La Utopía Magonista. Oaxaca, Mexico: Colegio de Investigadores en Educación de Oaxaca S.C.
Northeastern Federation of Anarchist-Communists (2010). Nature of the Period: Backgrounds and Perspectives. Retrieved from http://libcom.org/library/nature-period-background-perspectives-nefac. We are a relatively new (formed in 2007) provincial anarchist organisation in Ontario. We have branches in four cities: Hamilton, London, Ottawa, and Toronto. Members pay dues based on income level. Our goal: to be an organisation with roots in cities, towns, workplaces and communities all across Ontario.